Massachusetts recognizes workers' compensation claims based on post-traumatic stress disorder. 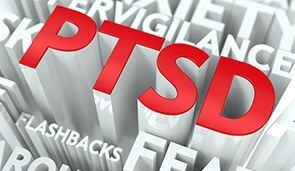 PTSD is often associated with war veterans or survivors of genocide, but it may happen after any sort of trauma, including events that occur in the workplace. A certain amount of stress and anxiety at work is normal, and ordinary stress is not compensable. But there may be serious events that occur in the workplace, including intentional infliction of emotional distress by a bully, or horrific extraordinary events, that are compensable when they cause psychological harm. If you suffer PTSD because of workplace conditions in the Boston area, the workers' compensation attorneys at Pulgini & Norton are ready to help you seek the benefits to which you may be entitled. Some work-related events that may give rise to PTSD include emergency workers responding to a horrifying crime or accident, observing a coworker's death in a mine or on a construction site, witnessing a school or bank shooting, or dealing with a prison riot. PTSD symptoms include flashbacks, nightmares, anxiety, headaches, nausea, fatigue, and irritability. In some cases, symptoms are delayed by months or years, which is classified as PTSD with delayed expression. This type of condition can be particularly challenging when filing a claim. This is because it can be all too easy for an insurer to point to other difficult intervening events as the reason for the PTSD. You should seek medical care from the very first time you experience symptoms, since this will help bolster a workers' compensation claim should you need to make it. Even though Massachusetts' workers' compensation law recognizes PTSD as a compensable injury, your allegations are likely to be more closely examined than allegations of a purely physical condition. Insurers may conduct surveillance and review any prior psychiatric or counseling records to try to find out whether symptoms are genuine. In order to collect benefits, you will need to offer medical evidence that a work event was a direct or contributing cause of your PTSD. You will need a diagnosis of PTSD by a medical doctor to make a legitimate claim, and once you have made the claim, you will probably be asked to submit to an independent medical examination (IME) by your employer's insurer as well. Workers’ compensation law, particularly with regard to psychiatric injuries, is complex. For example, if you have a pre-existing psychiatric condition such as anxiety or depression, the injury must be considered the predominant cause of your PTSD in order to be compensable. An insurer may argue that the symptoms are simply a part of the pre-existing psychiatric condition. It is important to be able to show a strong causal relationship between a workplace event or events and your PTSD. If you suffer PTSD because of a job-related event in Boston, you should enlist a work injury lawyer to assert your right to benefits. PTSD claims can be challenging, so it is important to get sound advice about every step of the process. The attorneys at Pulgini & Norton represent workers in communities throughout Massachusetts, such as Hyde Park, Andover, and New Bedford. Call us at 781-843-2200 or contact us via our online form for a consultation.